Both of Gordon Matta-Clark's parents were artists: the Chilean Surrealist painter Roberto Matta and American Anne Clark. He studied architecture at Cornell University, but did not practice as a conventional architect; he worked on what he referred to as “Anarchitecture.” He also spent a year studying French literature at the Sorbonne in Paris and was in this city during the student strikes of May 1968. He became aware of the French deconstructionist philosophers, Guy Debord and the Situationists. These cultural and political radicals developed the concept of détournement, or "the reuse of pre-existing artistic elements in a new ensemble." Such concepts would later inform his work. He is most famous for works that radically altered existing structures. His "building cuts" alter the perception of the building and its surrounding environment. Matta-Clark used a number of media to document his work, including film, video, and photography. His work includes performance and recycling pieces, space and texture works, and his "building cuts." In February, 1969, the "Earth Art" show, curated by Willoughby Sharp at the invitation of Tom Leavitt, was realized at Andrew Dickson White Museum of Art, Cornell University, Ithaca, NY. Matta-Clark, who lived in Ithaca at the time, was invited by Willoughby Sharp to help the artists in "Earth Art" with the on-site execution of their works for the exhibition. 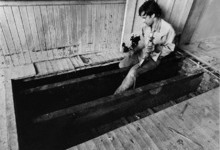 Sharp then encouraged Gordon Matta-Clark to move to New York City where Sharp continued to introduce him to members of the New York art world. 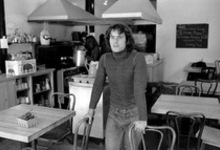 In 1971 Matta-Clark cofounded Food, in SoHo, New York, a restaurant managed and staffed by artists. The first of its kind in SoHo, Food became well known among artists and was a central meeting-place for groups such as the Philip Glass Ensemble, Mabou Mines, and the dancers of Grand Union. For the Biennale de Paris in 1975, he made the piece titled « Conical Intersect » by cutting a large cone-shaped hole through two townhouses dating from the 17th century in the market district known as Les Halles which were to be knocked down in order to construct the then-controversial Centre Georges Pompidou.